The Ministry has recently been temporarily on a low readiness due to the big weekends. The Minister has been reported being very relaxed and laid back and generally just taking it very easy. The big weekends (Christmas) traditionally bring heaps of food. This year was no exception. The swedish smorgasboard is only topped by the swedish â€œjulbordâ€ where heavy food is copious plentiful. 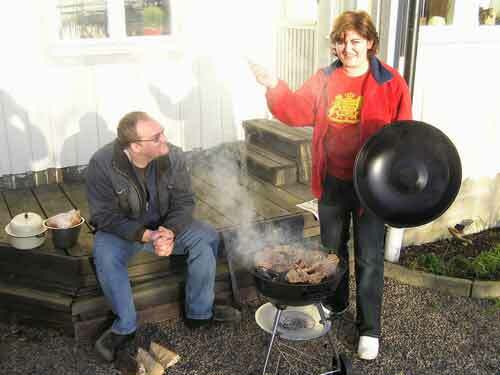 This year however brought new traditions from south Europe â€“ Christmas day outdoor barbeque! This is â€œa mustâ€ in a great part of the world and the Ministry acknowledge and adopt the tradition from amongst others; Balkan, Romania and the micro nation NSK (friend-state of Ladonia) â€“ the tradition to get outdoors, gather around a campfire and make an outdoor barbeque on December 25. The X-mas day BBQ brought deliciously marinated chicken and pork – and a stuffed belly. Our skilled Chef served the grilled meat with baked potatoes, a cold spicy garlic-sauce and a salad of fresh red cabbage with oil, vinegar, salt, pepper and dill. A fantastic symphony of tastes, and a new tradition that connect the Ministry with another cultural experience. The weather on the Christmas Day was almost unbelievable nice with clear blue skies, a warm winter sun and calm winds 5-10 degrees Celsius. It felt almost like a spring-day in sweden! 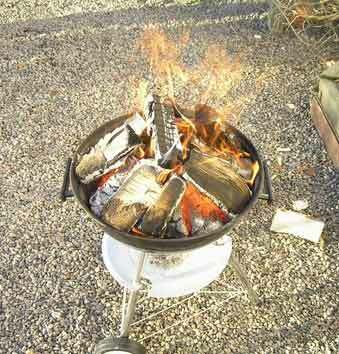 Itâ€™s always nice with a good weather even if the fire was warming. The sunny winter day made stronger internal medicaments (fire-water) to fight off the cold, totally unnecessary. The Global Consciousness Project (http://noosphere.princeton.edu), runs a network of Random Event Generators (REGs) around the world, which record changes in randomness during global events. The results show that human consciousness can be measured to have a global effect on matter and energy during widely-watched events such as 9/11 and the Indian Ocean tsunami. There have also been measurable results during mass meditations and prayers. The Zero Point Field or Quantum Field surrounds and is part of everything in the universe. It can be affected by human consciousness, as can be seen when simple observation of a subatomic particle changes the particleâ€™s state. Today on Winter Solstice Day – Friday, December 22nd, is the time to join in on the G.O. In the place of your choosing and with as much privacy as you choose, and at a time of your choosing. If you want to synchronice it go to the homepage to get a countdown-clock. The people behind the event wants everyone to join the project everywhere in the world, especially in countries with weapons of mass destruction. (Note how cunningly the artist have created the effect that the figure’s eyes will look upon you even if viewed from the side). 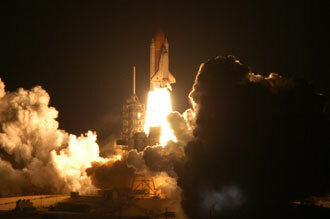 At the same time the “STS-116”-crew is returning home after a successful mission to the International Space Station. 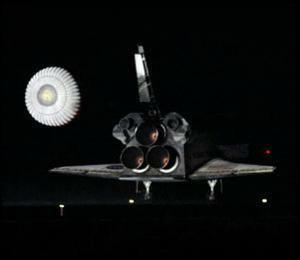 The STS-116 crew closed Space Shuttle Discoveryâ€™s payload bay doors about 12:13 p.m. EST in preparation for a 3:56 p.m. landing at Kennedy Space Center, Florida. If flight controllers elect to take this landing opportunity, Commander Mark Polansky will fire Discovery’s jets to begin the descent to Kennedy at 2:49 p.m.
Three landing sites have been activated today due to forecasts of questionable weather at Kennedy and Edwards Air Force Base in California. The forecast for the White Sands Space Harbor in New Mexico is favorable. 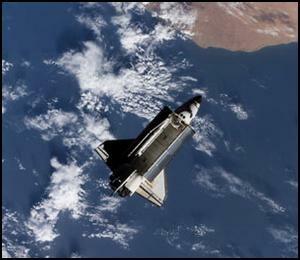 (New Mexico haven’t been used for Space Shuttle landing since 1982). Six more opportunities are available today if flight controllers pass on the first. The last opportunity at Kennedy is at 5:32 p.m. Three exist at Edwards â€“ 5:27 p.m., 7 p.m. and 8:36 p.m. Two are available at White Sands â€“ 5:27 p.m. and 7:02 p.m. While at the station, the crew continued the construction of the outpost with the addition of the P5 spacer truss segment during the first of four spacewalks. The next two spacewalks rewired the stationâ€™s power system, leaving it in a permanent setup. A fourth spacewalk was added to allow the crew to retract solar arrays that had folded improperly. Discovery also delivered a new crew member and more than two tons of equipment and supplies to the station, most of which were located in the SPACEHAB cargo module. 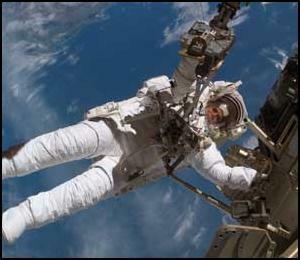 Almost two tons of items no longer needed on the station are returning to Earth with STS-116. The sun is blank and solar activity is low. It’s that time of the year again and the Ministry would like to extend a very special greeting to all of you from all of us! Imorgon lÃ¶rdag, den 16 december, kommer en unik fÃ¶rhandsvisning av en ny Musik-DVD att ske i LinkÃ¶ping – nÃ¤rmare bestÃ¤mt hos “ELSA i Underjorden“. Det som spelas upp och projiceras pÃ¥ storbildsduk pÃ¥ scen Ã¤r den Ladonska konsertfilmen . (Se bifogad information). Konsertfilmen spelades in under sommaren 2006 dÃ¥ det bland annat genomfÃ¶rdes en stor utomhuskonsert nÃ¤r Mikronationen Ladonien firade sitt grundande och 10-Ã¥rsjubileum (29 juli). DÃ¤r medverkade en elektronisk musikgrupp som ett genomgÃ¥ende inslag under heldags-evenemanget. Detta ledde senare till att det slÃ¤pptes en skiva med musik frÃ¥n uppfÃ¶randet fÃ¶r under jubileet. VÃ¥ren 2007 berÃ¤knas DVD-releasen (LIVE in Ladonia) slÃ¤ppas. Det Ã¤r en slags musikaliskt dokumentÃ¤r konsertfilm frÃ¥n 10-Ã¥rs jubileet dÃ¤r Ladonien stÃ¥r i centrum. Filmen Ã¤r inspelad pÃ¥ plats i Ladonien som ligger strax utanfÃ¶r HÃ¶ganÃ¤s i nordvÃ¤stra SkÃ¥ne. Den fÃ¤rdiga filmen innehÃ¥ller Ã¤ven intervjuer och det medverkar flera aktÃ¶rer, bland annat Mikronationens President, Statssekreterare, PÃ¥ve och Ministrar. Ministeriet gratulerar idag Lucia som har namnsdag. Det finns 3150 kvinnor i landet som har Lucia som fÃ¶rnamn, men bara 496 har det som tilltalsnamn. Det finns inga mÃ¤n i Sverige som har Lucia som tilltalsnamn (dÃ¤remot finns det 8 stycken mÃ¤n som heter Maria). Stort grattis till alla Lucior pÃ¥ deras namnsdag! Det finns flera olika legender om den Lucia frÃ¥n Syrakusa som dog martyrdÃ¶den Ã¥r 304 e. Kr och som helgonfÃ¶rklarades hundra Ã¥r efterÃ¥t. En legend berÃ¤ttar att Lucia skulle brÃ¤nnas pÃ¥ bÃ¥l fÃ¶r att hon var kristen, men att lÃ¥gorna vek undan sÃ¥ att elden inte kunde skada henne. IstÃ¤llet fick hon dÃ¶das med svÃ¤rd- och dÃ¤rfÃ¶r har Lucia Ã¤n i dag det rÃ¶da bandet, som symboliserar hennes blod, runt midjan. En annan legend berÃ¤ttar att en ung hednisk man blivit fÃ¶rÃ¤lskad i Lucia, pÃ¥ grund av hennes vackra Ã¶gon. Det var omÃ¶jligt fÃ¶r den kristna Lucia att gifta sig med en hedning och dÃ¤rfÃ¶r rev hon ut sina Ã¶gon och gav dem till honom. DÃ¤refter fick hon nya, Ã¤nnu vackrare, Ã¶gon av Gud. Lucia blev Syrakusas skyddshelgon efter sin dÃ¶d och hon firas som helgon i den romersk-katolska kyrkan den 13 december. Det Ã¤r Lucia som Ã¥kallas vid Ã¶gonsjukdomar och hon avbildas ofta bÃ¤randes pÃ¥ sina Ã¶gon pÃ¥ ett fat. Och dÃ¤rmed fÃ¥r ju lussebullarna (lussekatterna) med sina russin sin fÃ¶rklaring och det kÃ¤nns inte lika gott att Ã¤ta Lucias Ã¶gon-bullar i fortsÃ¤ttningen… (Ã¶rk liksom!). 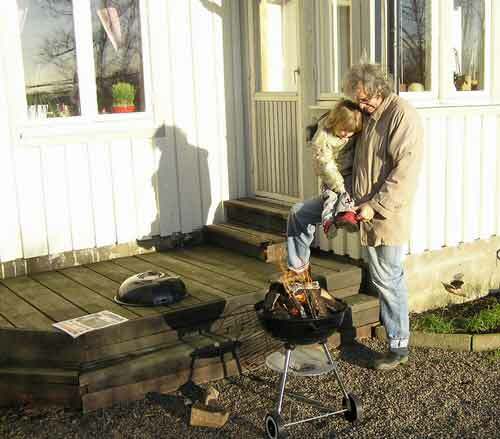 I Sverige var lucianatten den lÃ¤ngsta, mÃ¶rkaste och farligaste natten. En fÃ¶rtrollad natt nÃ¤r djuren kunde prata och det Ã¶vernaturliga hade stor makt. Onda och farliga krafter var i farten och man skulle hÃ¥lla sig inomhus, sÃ¥ att man inte kom i vÃ¤gen fÃ¶r Lucifer! Lucifer Ã¤r liksom Lucia bildat frÃ¥n det latinska ordet lux, dvs ljus. I gammal folktro Ã¤r Lucia densamma som Lilith, Adams fÃ¶rsta, onda hustru som Ã¤r moder till de underjordiska. Ã…r 1753 bytte vi frÃ¥n den Julianska till den Gregorianska kalendern och dÃ¤refter har lucianatten inte lÃ¤ngre varit den lÃ¤ngsta natten, men mÃ¶rkret har Ã¤ndÃ¥ behÃ¶vt drivas bort! PÃ¥ en del hÃ¥ll satt man inne och vakade natten igenom och tidigt pÃ¥ luciamorgonen skulle man Ã¤ta luciafrukost med smakbitar frÃ¥n julslakten! Det kunde vara sylta, korvar, grisfÃ¶tter, flÃ¤sk, bruna bÃ¶nor, kaffe, lussebrÃ¶d, Ã¶l och brÃ¤nnvin. Ã„ven djuren fick lite extra mat fÃ¶r att de skulle Ã¶verleva den hÃ¥rda vintern. Under medeltiden skulle man helst hinna Ã¤ta elva frukostar innan solen gick upp! 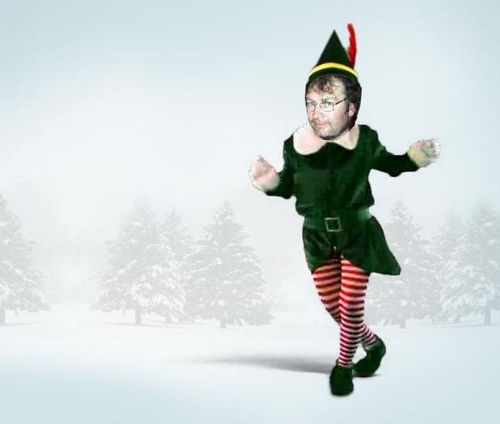 Den 13 december bÃ¶rjade fastan, sÃ¥ det gÃ¤llde att Ã¤ta sÃ¥ mycket man kunde! Under fastan var bl a allt kÃ¶tt bannlyst och man fick klara sig pÃ¥ fiskdiet. De fÃ¶rsta luciatÃ¥gen kallades fÃ¶r lussefÃ¤rden och handlade mer om Lucifer (djÃ¤vulen) Ã¤n om Lucia. Ungdomarna sotade ansiktena, klÃ¤dde ut sig i gamla klÃ¤der och djurpÃ¤lsar, stoppade upp sig med halm och drog runt mellan gÃ¥rdarna dÃ¤r de sjÃ¶ng och skrÃ¥lade. Ofta var nÃ¥gon utklÃ¤dd till Lucifer, Ã¤ven kallad LussepÃ¤r, med horn i pannan. Som tack fÃ¶r spektaklet ville de ha lusselimpa och en sup, men folket i gÃ¥rdarna fÃ¶rsÃ¶kte freda sig frÃ¥n besÃ¶k. 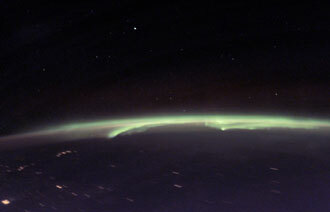 So finally Sweden has a man in space. 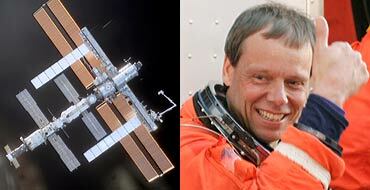 After years and years of waiting, Christer Fuglesang is finally in space and heading for ISS. It feels almost like it was me, since he alledgedly should be the doppelganger of the Minister… The Ministry wishes Christer Godspeed! Mr Fuglesang and his gang heading for the International Space Station. You are currently browsing the Ministry Blog weblog archives for December, 2006.